Commercial Paving, Re-Surfacing & Landscaping Contractors" Gark Kirk are happy to undertake commercial groundwork projects of any size. We can take care of all your soft and hard landscaping requirements including block paving, tarmac, concrete, drainage, road & car park construction, turfing, fencing, gate automation and vehicle access solutions. Our workforce is sizeable and skilled, backed up by the latest machinery and vehicles allowing us to economically tender for commercial contracts. Furthermore we do not use sub-contracted labour. We are the preferred contractor for many schools, private companies and local authorities. When you instruct Gary Kirk you can be safe in the knowledge you are dealing with a reputable, established company that provides great resources, communication skills and above all delivers complete client satisfaction. If you would like to arrange for a site visit to discuss your requirements please call us Block Paving Essex, Driveways & Patios for The East Midlands We are specialists in the art of block paving for driveways and patios in Essex. We have been building patios and driveways for many years that reach the very highest standards. All our driveways and patios are laid on a concrete base for added strength. We never use type 1 bases to ensure your driveway and patio is as good as new, even years after it was laid. Established in 1985 in Nottingham we have built a enviable reputation for quality, reliability and good service. This resulted in our appointment to the Gary Kirk Register of Approved Landscape Contractors and Driveway Installers for Nottinghamshire in 2000. 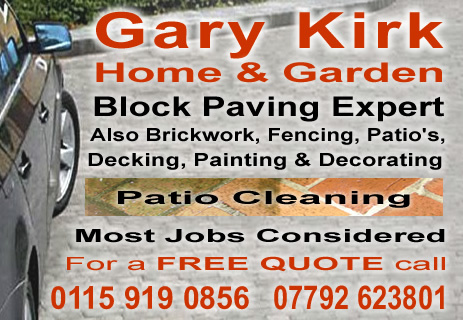 Gary Kirk Paving are also proud to be associated with the Guild of Master Craftsmen, as we are a full associated member, so peace of mind for our customers is assured. We can provide the Gary Kirk's 10 year, Parts & Labour Guarantee, delivering the assurance, plus peace of mind that only a meaningful guarantee from a manufacturer can provide. Details of the type of work we undertake are included within the pages of our website, examples of our block paving projects in Nottingham & The East Midlands can be viewed and references taken. For a free, no obligation quotation, please click here to complete an enquiry form or contact us. We will then discuss your requirements and then arrange a site survey. We are able to lay Block Paving Driveways & Patios anywhere across The East Midlands including all the major towns.